Analysts warned that the gains may only be temporary, and Russians should brace for another acceleration of inflation in the fall. After a year of skyrocketing food prices that have forced many Russians to spend less on what they eat, the cost of many categories of food has finally begun to stabilize or fall, official data show. Food price inflation has been one of the harshest consequences for ordinary Russians of the country's confrontation with the West over Ukraine and the ongoing economic crisis. A steep devaluation of the ruble and bans on imports of European produce — Moscow's retaliation to sanctions — pushed the average cost of food up by 20 percent in the 12 months to July, according to official statistics. Now at last a springtime strengthening of the ruble and the start of the summer harvest season in local agriculture are pushing prices down, especially of fruit and vegetables. But analysts warned that the gains may only be temporary, and Russians should brace for another acceleration of inflation in the fall. The cost of food has seen a record decline since the start of April, the Industry and Trade Ministry said in late July. The ministry published data on a clutch of products that said the price of eggs fell by 20 percent over the period from April to mid-July, the cost of granulated sugar by 2.4 percent, fish by 3.8 percent and cheese by 7.6 percent. The most dramatic falls were in the cost of fruit and vegetables. The price of cucumbers fell by 58.7 percent over April to mid-July, while the cost of tomatoes tumbled 41.3 percent, the ministry said. 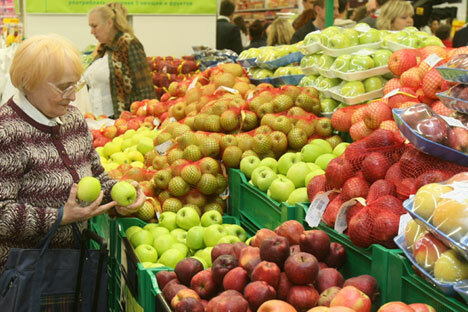 According to state statistics agency Rosstat, from June 30 to July 27 the price of most categories of food fell. Only sugar, candy, chocolate, carrots and apples saw their prices increase by more than 0.5 percent over the period. But despite recent declines, prices are still far higher than they were one year ago. Food price inflation accelerated into double digits for the first time since 2011 in August last year, after bans on a range of food imports from the European Union, United States and some other countries caused supply shortages and forced retailers to switch to more expensive suppliers. The inflationary effect of the bans was exacerbated by a sharp fall in the value of the ruble in the second half of 2014, which raised the cost of imported goods and services. The result is that vegetables and fruit cost on average 22.8 percent more in June than in the same month in 2014, according to Rosstat. Over the same period, the cost of meat and poultry increased by 15 percent, sugar by 29.6 percent, fish and seafood by 31.4 percent, bread and backed goods 14.9 percent and grains and legumes by 43.4 percent, Rosstat data show. The recent price decreases have coincided with the local harvest season, which traditionally runs from June to October. Thanks to this expansion of local farming following the food import bans, this year's harvest is a record breaker, according to Alexei Plugov, head of agricultural research company AB-Center. Russian retailers are now importing 20-40 percent fewer vegetables, depending on the type, he said. Another factor exerting downward pressure on prices is falling demand. High inflation has eroded the value of Russians' wages, and consumers have reacted by slashing their spending and choosing cheaper items. According to the report issued in April by consumer research firm Nielsen, nearly half of Russians said they had cut their spending on basic goods and food by an average of 24 percent in the first three months of this year. The cost-cutting has boosted lower-cost supermarkets, while higher priced chains have struggled to preserve revenues. "If demand continues to decline, prices will continue to fall. If not, we will see prices grow again," said Natalya Shagaida, director of the Center for Agrofood Policy at the Russian Presidential Academy of National Economy and Public Administration. Yana Mogilyova, regional communications manager of budget hypermarket chain Lenta, said the company had noticed signs of recovering sales in July compared to June, but that it was too early to talk about sustainable trend. Plugov said that until the harvest season ends in October, prices would decrease, but that they would start creeping up again once domestic supplies end. A recent weakening of the ruble may help push them up. After strengthening by around 35 percent to the U.S. dollar over February to mid-May, the ruble has reversed half of those gains. It now takes just over 60 rubles to buy a dollar, up from around 35 rubles a year ago, meaning that imported goods will be more costly. But high inflation may not last for ever. The Central Bank said Friday that overall inflation, which stood at 15.8 percent as of July 27, would fall to 7 percent in July 2016 and to 4 percent in 2017.